The Law on Chemicals is the overarching regulation in Vietnam that regulates the activities related to chemicals and chemical industry. 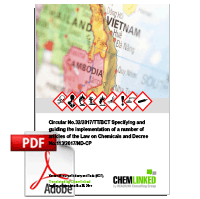 Since the publication of the Law in 2007, Vietnam government has been promulgating new implementation guidelines and revisions to the Law in order to align the regulatory requirements with latest developments and demands in the chemical industry, among which the Decree No.113/2017 is the most important one. To further assist the implementation of the Decree No. 113/2017, MOIT published a ministerial circular named Circular No. 32/2017/TT-BCT in Dec 2017 and specified a number of articles of the Law on Chemicals and the Decree No. 113/2017. The Circular took effect on Dec 28th, 2017. Reporting regime of chemical management in industry and trade.